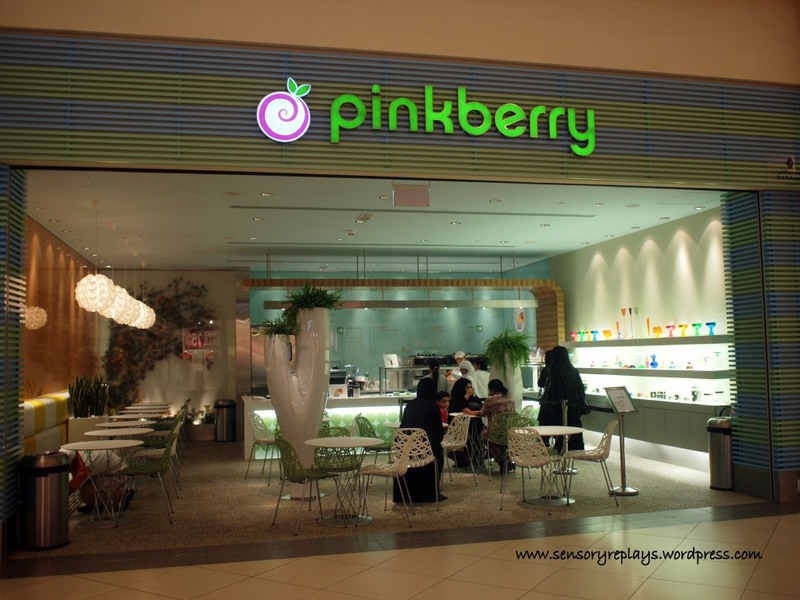 i was craving for frozen yogurt yesterday and i remembered seeing a pinkberry store at ajman city centre. i have never tried their yogurt before but i knew that it is well-known back in the states. 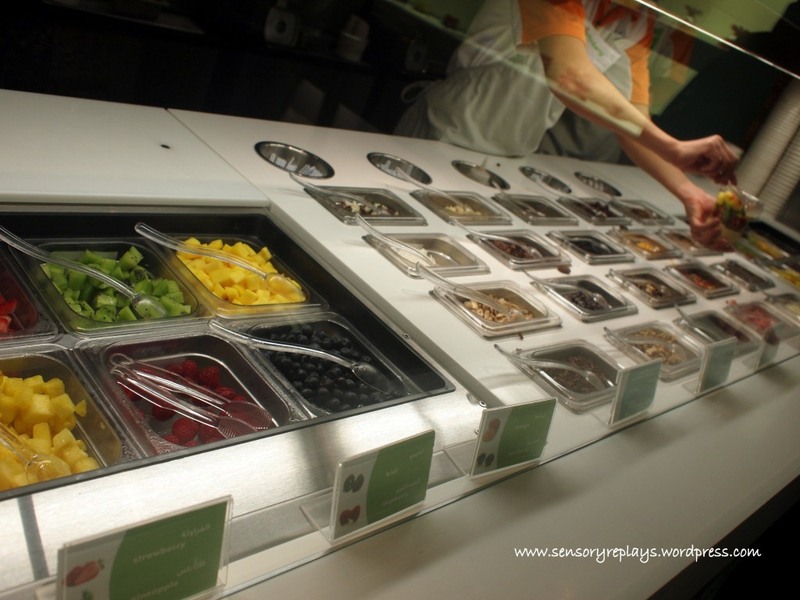 when i made it at pinkberry, i was trying to figure out what yogurt flavor to order when the guy at the counter asked me if it was my first time to try their yogurt (i’m wondering now if i looked like a confused kid staring at their menu!). i said yes and he cheerfully gave me a ‘taste test’ on the yogurt flavors available. there was mango, pomegranate, passion fruit, coconut, original and chocolate. he said they also have green tea which was not available that time. of all the flavors i tasted, i liked the pomegranate. the chocolate was also good but i wanted something different. i opted for a tailor-your-own fruit parfait, where one can choose three fruit, two dry toppings and two yogurt flavors. my fruit parfait consisted of bite-size strawberries, pineapple and kiwi, some honey almond granola, fruity pebbles, pomegranate and mango yogurt. 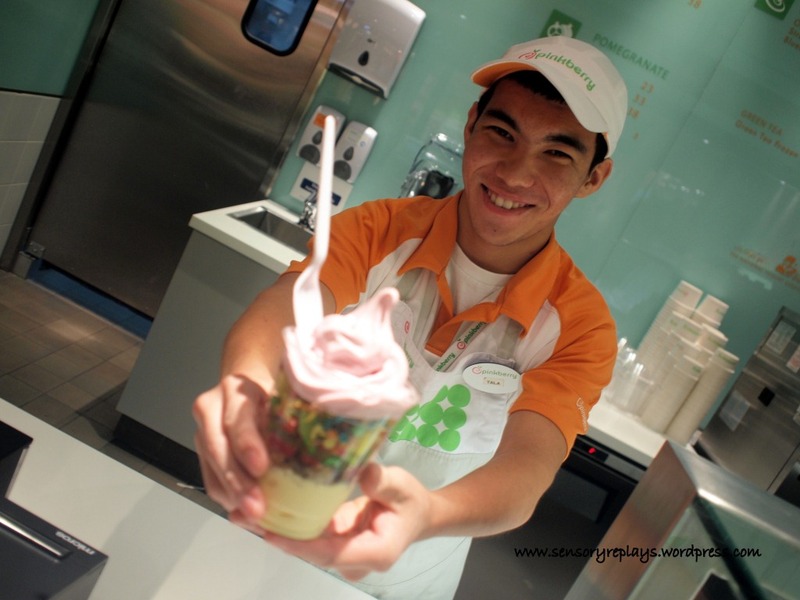 This entry was posted in palate teasers and tagged ajman, ajman city centre, frozen yogurt, pinkberry, yogurt. Bookmark the permalink. pineapple and kiwi in a yogurt? weird. or is it me that’s weird? haha. kala ko naman you’re already home.. hehe. ang laki naman nyan! naubos mo? he he! sarap! .. slight lang ang smile nya, hehe. .. i think frozen yogurt is better compared to ice cream claire, it lessens that guilt feeling! sama naman sa next taste test mo! ganyan din dito, last time i enjoyed taste test like a kid was when i bought gabby a wafer cone of baskin n robbins. sarap ng libreng taste test! 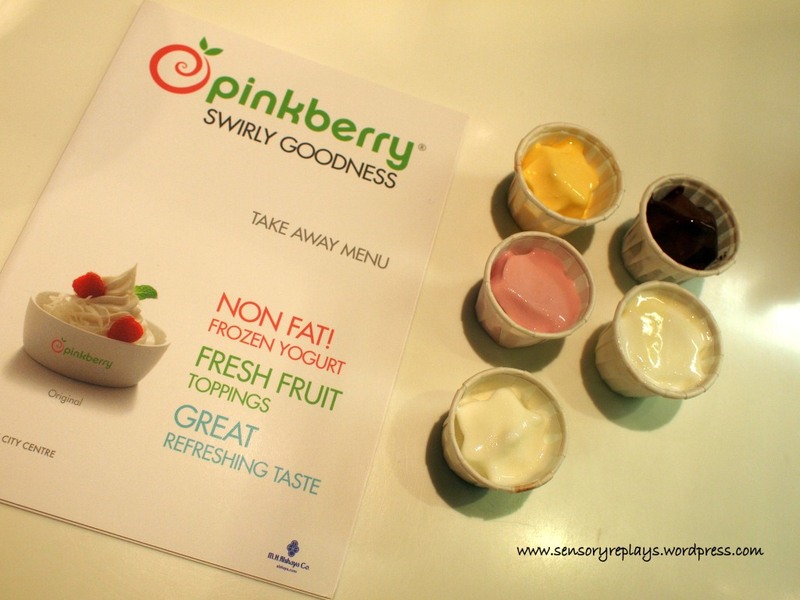 hahaha..
how does pink berry rate on your palate? mas ok ba sya sa red mango, fro-yo, golden spoon? na-miss ko golden spoon sa shangri la mall. .. i was kind of embarassed at first, tapos bigla ko naisip na pityuran ko nga at maipost, haha. .. doc, i haven’t tasted yogurt at golden spoon and red mango. the ones i had are btic (they also own fro-yo) and whitehat (yan ang regular yogurt stop ko sa shang mall, masarap yung may chocnut!). plain lang yung mga natikman ko so i really can’t compare. penge! though am trying to experiment with yoghurts, too. kapag success, patikiman kita, hehehe. coconut and passion fruit are two of my favorite flavors, i wonder if they would blend perfectly, i cannot imagine the taste of them together in one spoonful. 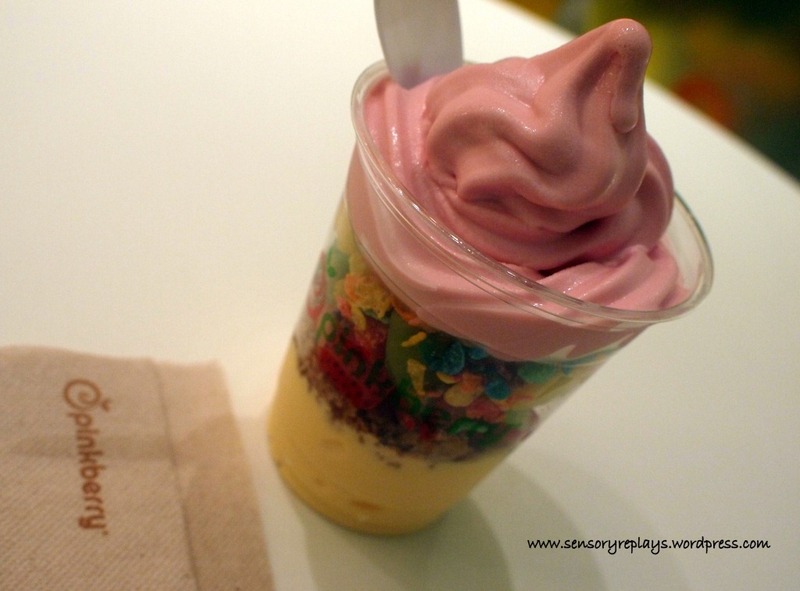 i love frozen yogurt! penge niyan! rob nasan ka? sorry naman ha ang tagal ko natigil eh!